The easiest way to order is to use the form on the left. (See below for alternatives). We accept orders from anywhere in the world and will post or email your photos to you with 24 hours of receiving your order. Please note that it can take up to 10 days for photos to be delivered due to postal services throughout the world. We send printed copies sent through the post. If you have sent us a photo for resizing for an online passport or visa application, or for a Green Card Lottery Photo in a digital format, we will email these back to. If you are having trouble with our online form, or need to send us extra photos, you can email us direct and attach the neccessary photos. Don't forget to include your name and address and special instructions. Any photos you send to us should look similar to the one below ( with the correct colouir background). We will resize and crop to the correct specifications. 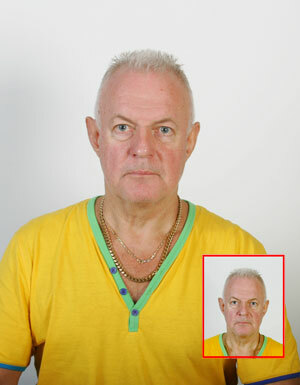 If your online order for passport or visa photos gets rejected for any reason we will refund the cost - simply post the photos back to us to receive your refund.